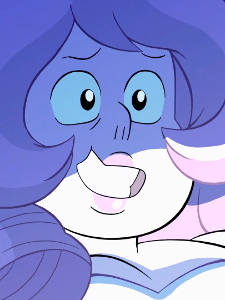 We never put forth the question of whether Rose could be Pink Diamond because even very early on we considered it highly likely that she was, though back then Chille Tid was the most recent episode and all we had to go on was the significance of Rose to the series backstory and a nagging sense that Steven was being treated like the son of royalty. As time went on and evidence mounted we just became more sure that we had been right to pick up those hints. Consider just how many different magical powers Rose Quartz had versus what Jasper (the ultimate quartz, remember) had (that is to say: a variety of powers for Rose, while Jasper was just really strong). This isn’t an exhaustive look at the foreshadowing in the series, but the revelation really does make a lot of things look very different; even Cookie Cat with its two ice cream flavors, pink-colored strawberry and more flesh-colored vanilla, makes one wonder just how much was meant to be hinting at the possibility. A very common counter-theory to the idea that Rose was Pink Diamond was that the coming twist (for it couldn’t really be so simple that Rose rebelled and shattered Pink Diamond as everyone thought) was that Pearl had in fact shattered Pink Diamond and Rose took the blame; people even surmised that Pearl no longer shapeshifted because of how she felt after taking Rose’s form to shatter Pink Diamond—apparently correctly, by the way. It was also interesting to see that Pink shapeshifted into Rose Quartz (presumably until Pearl poofed her, after which she could take her Rose Quartz form permanently) rather than having to body swap to do it. Certainly nobody expected to learn, this late in the series, that it is somehow possible for a Gem to reorient her gem when she shapeshifts, but if anyone could do it a Diamond surely could (remember all of the other non-quartzlike powers Rose had). So there it is: the answer to one of the biggest questions the series has posed. How is everyone doing going back and re-examining the series for more vague possible hints? Cookie Cat will probably be tough to top. A lot of people thought he was the son of a revolutionary, and he is really loved by Rose’s fellow revolutionaries, and it’s his charisma that makes him loved by the Beach City citizenry. Now we have to question if that charisma comes from his gem or if it was Greg all the time. I think there was also the belief that maybe these powers came from Steven’s hybrid nature and were totally unique and new to Gems and now we find out, nope, just the powers of royalty or the happy accident from how Pink Diamond came out small, unless White Diamond wanted the possible-compassionate diamond the weakest one.